There is an academic dispute about when and the direction humans traveled when they first arrived in the Americas. 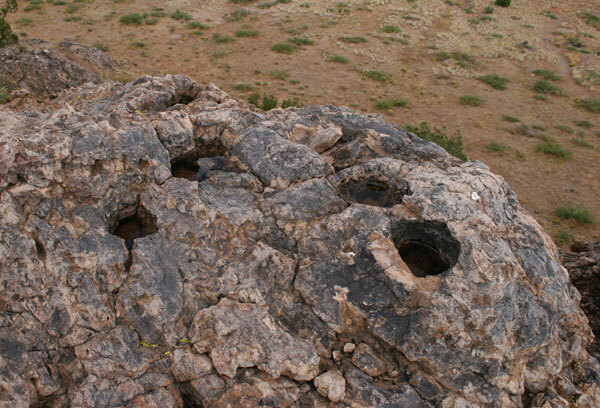 The generally accepted Clovis First school maintain the First Nations People arrived by way of the Bering Strait and settled in New Mexico some 15,000 years ago. 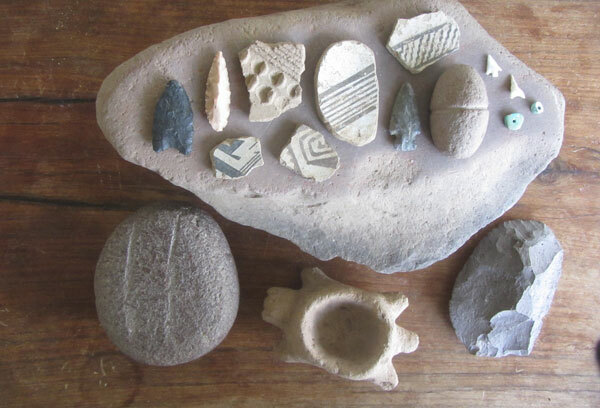 There are increasing numbers of archaeologists who maintain Paleo-Indians left Asia by boat 40,000 to 20,000 years ago and migrated down the west coast of South America, living on fish, and subsequently migrated northward from there. The most recent challenge to the Clovis First school is far more extreme than the “watercraft” scholars. In April 2017, scientists at the San Diego History Museum published a paper in the journal Nature contending the partial remains of the American Mastodon discovered in San Diego during a 1992 freeway expansion were smashed by Homo sapiens with large rocks to make tools and extract nutritious bone marrow some 130,000 years ago. Pushing human antiquity in the Americas back more than 100,000 is by far the most radical challenge yet to those who believe human arrival was by way of the Bering Strait. There is also the finding of a mammoth or mastodon image on a 13,000-year-old bone fragment found near Vera Beach, Florida. 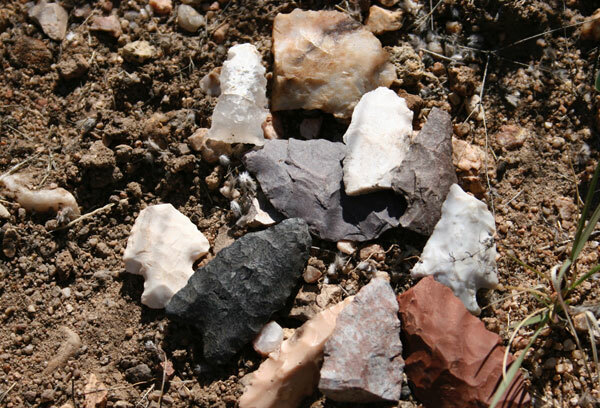 Leaving this hotly debated question aside, we know Archaic people were here at least 11,000 years ago because Lucinda found a worked Clovis point on a mound where successive cultures lived, presumably for the same reasons: safety, closeness to water and beauty. 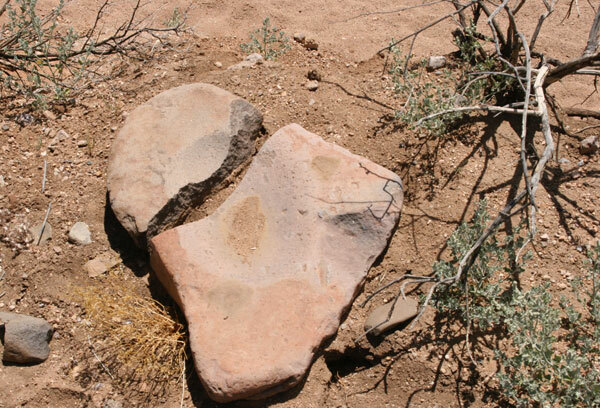 For unknown reasons, around 200 Current Era (CE), important changes occurred in the lives of those who made their homes beyond the Mimbres river some 30 miles east of the Pitchfork Ranch. The Mimbreño people then moved to the tops of hills or ridges along the Mimbres River for some 350 years before moving into the valley for good until 1130 CE when they dispersed because of drought, overuse, overpopulation and many of the same mistakes we are making today. 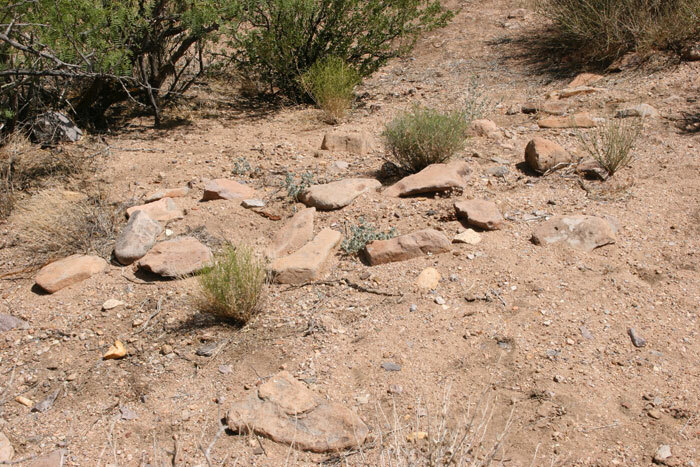 Archaeology Southwest in Tucson, Arizona, has identified 21 Mimbres sites along the 9-mile reach of the Burro Ciénaga on the Pitchfork (and there are others off channel), and there is abundant cultural material from which archaeologist Pat Gilman determined they resided at one of those sites continuously from 750 Before Present (BP) to 1130 BP. 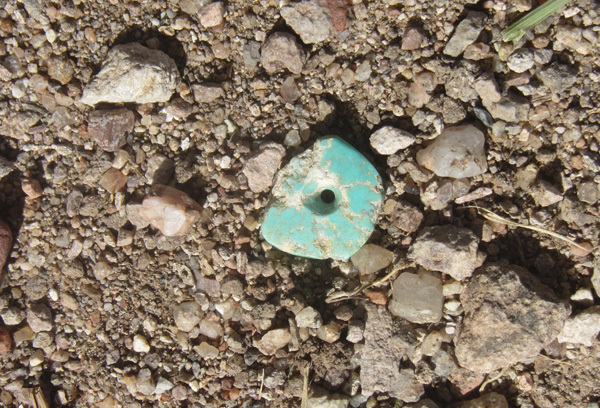 A turquoise bead, stone carved “beartle” (either a bear or a turtle or both) and other artifacts from that and other sites are shown here. We don’t allow digging. The Mimbreño people were followed by the Athabaskans and then the Apaches. 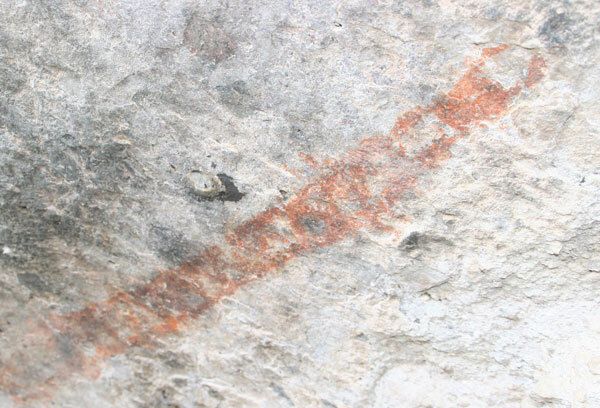 An Apache painting of a hellgrammite made us think they used the animal for fish bait — a common practice among fishermen today — but a local Apache elder tells us that it is a mountain spirit.